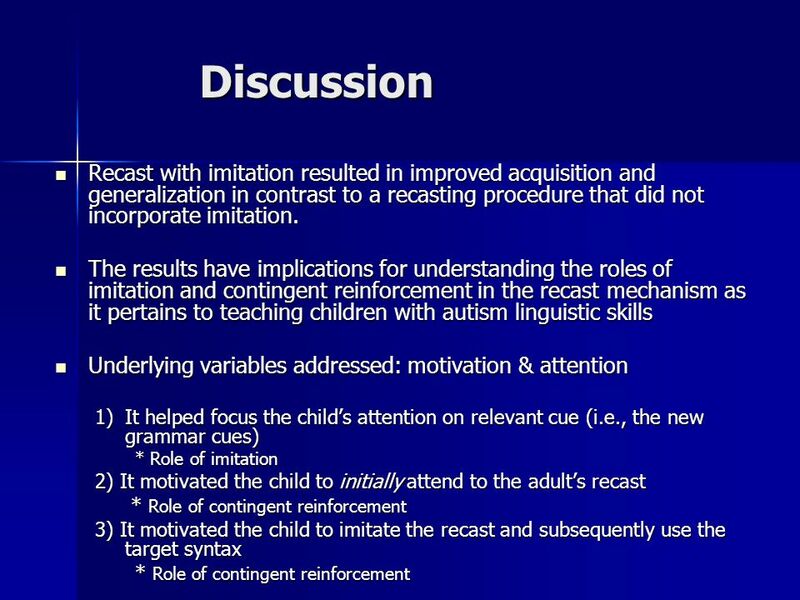 Effects of Conversational Recasting with Imitation on the Acquisition of Linguistic Structures in Children with Autism GREGORY LYONS, Lynn Koegel, Robert. 1 Effects of Conversational Recasting with Imitation on the Acquisition of Linguistic Structures in Children with Autism GREGORY LYONS, Lynn Koegel, Robert Koegel Presentation for Recent Advances in Autism Research University of Wisconsin - Madison Research Conducted at: University of California, Santa Barbara My project is entitled “Improving the Acquisition of Target Linguistic Skills in Young Children with Autism” and is essentially concerned with grammar rules, and as such I hope that all of the tenses I use in this presentation are accurate…and if not, a simple recast should help me out. 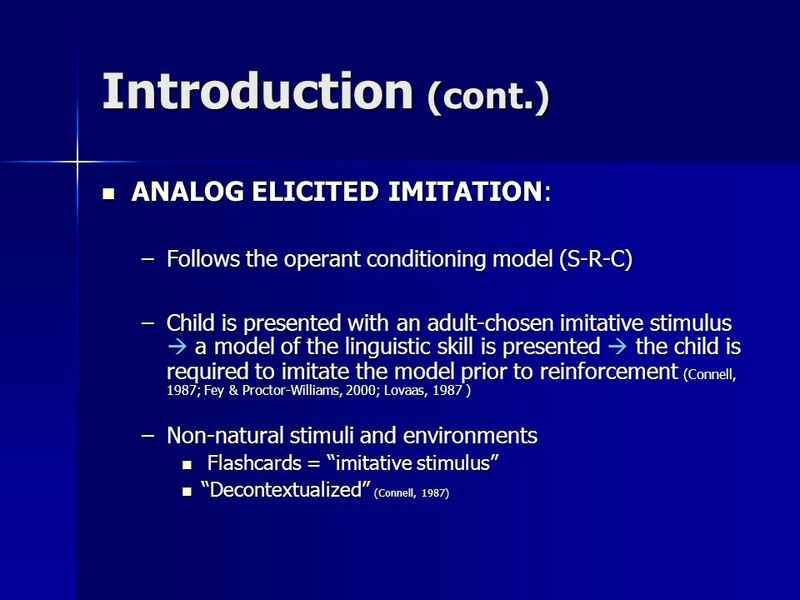 Follows the operant conditioning model (S-R-C) Child is presented with an adult-chosen imitative stimulus  a model of the linguistic skill is presented  the child is required to imitate the model prior to reinforcement (Connell, 1987; Fey & Proctor-Williams, 2000; Lovaas, 1987 ) Non-natural stimuli and environments Flashcards = “imitative stimulus” “Decontextualized” (Connell, 1987) Analog elicited imitation follows an operant conditioning model (stimulus-response-consequence) and argues that individuals who do not learn language naturally, learn best through the de-contextualized presentation of grammar coupled with imitation practice. 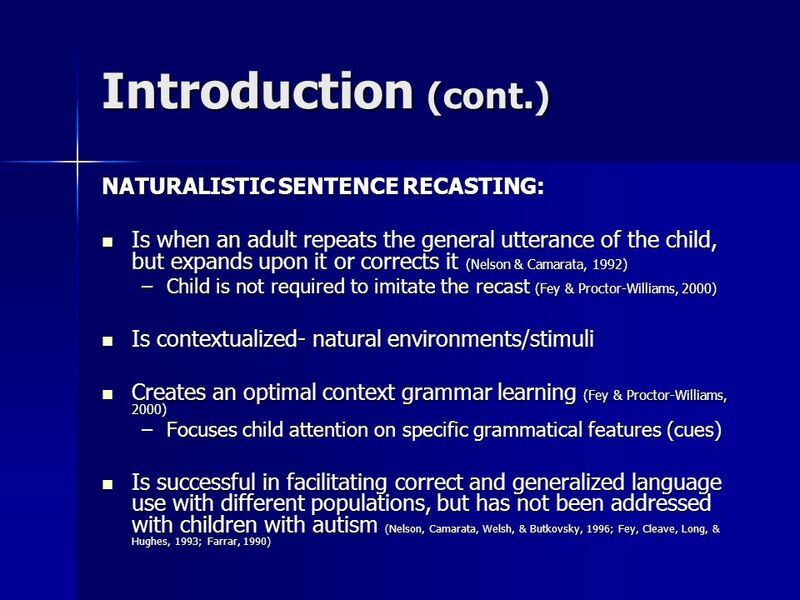 Is when an adult repeats the general utterance of the child, but expands upon it or corrects it (Nelson & Camarata, 1992) Child is not required to imitate the recast (Fey & Proctor-Williams, 2000) Is contextualized- natural environments/stimuli Creates an optimal context grammar learning (Fey & Proctor-Williams, 2000) Focuses child attention on specific grammatical features (cues) Is successful in facilitating correct and generalized language use with different populations, but has not been addressed with children with autism (Nelson, Camarata, Welsh, & Butkovsky, 1996; Fey, Cleave, Long, & Hughes, 1993; Farrar, 1990) Has become the preferred mode of treatment by speech therapy practitioners and researchers. 6 Introduction (cont.) 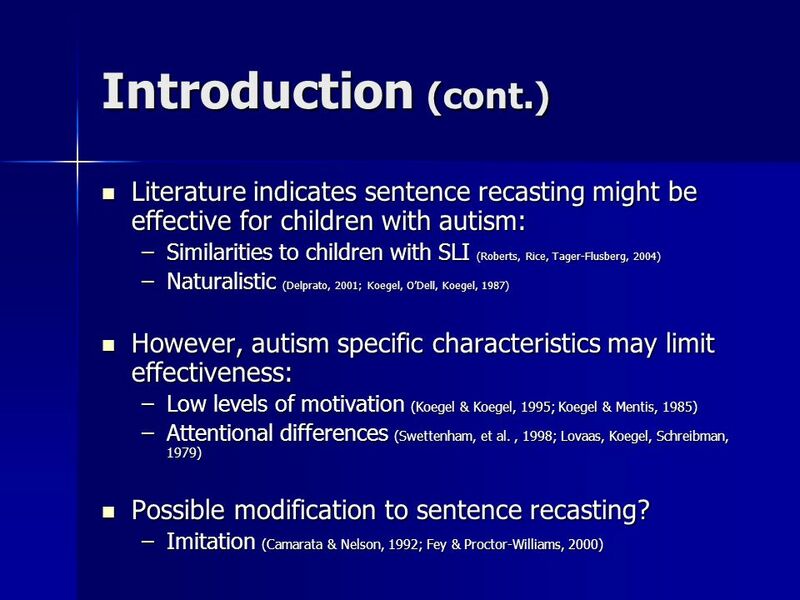 Literature indicates sentence recasting might be effective for children with autism: Similarities to children with SLI (Roberts, Rice, Tager-Flusberg, 2004) Naturalistic (Delprato, 2001; Koegel, O’Dell, Koegel, 1987) However, autism specific characteristics may limit effectiveness: Low levels of motivation (Koegel & Koegel, 1995; Koegel & Mentis, 1985) Attentional differences (Swettenham, et al. 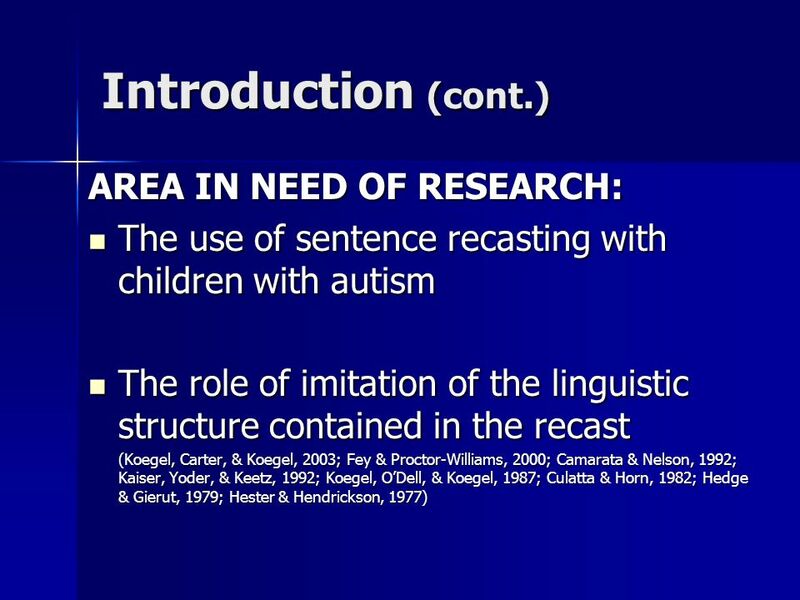 , 1998; Lovaas, Koegel, Schreibman, 1979) Possible modification to sentence recasting? Imitation (Camarata & Nelson, 1992; Fey & Proctor-Williams, 2000) Given that the literature has suggested a similar profile to children with SLI, and given the shift in treatment paradigms toward more naturalistic procedures, sentence recasting would seem to be a useful intervention in remediating syntactical language difficulties in chidlren with autism. However, autrism specific charateristics in the realms of motivation and attention might conflict with the hypothesized mechanism of recasting discussed in the prior slide. Despite this, some researchers suggest that (for some children) imitation and sentence recasting can effectively complement each other. 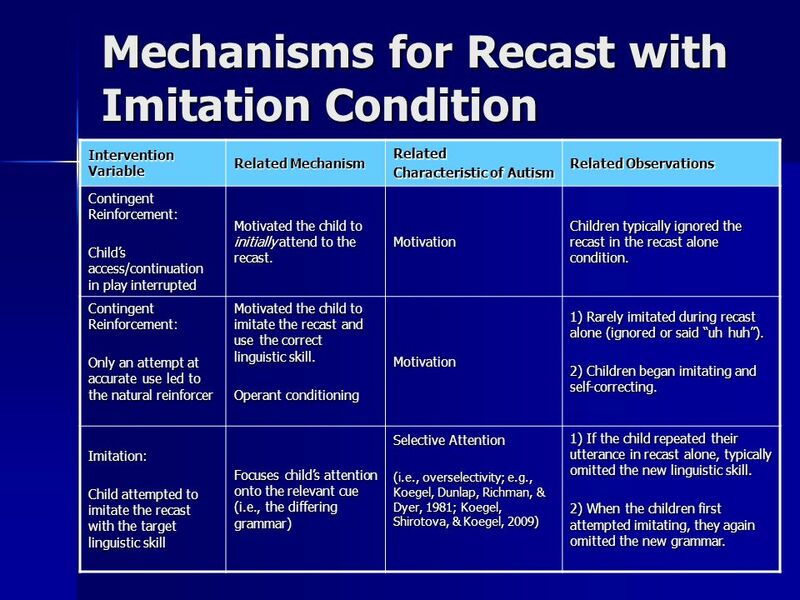 Camarata and Nelson (1992) have speculated that imitation might have a role in helping some children first attend to the target structure in the input (i.e., the recast) and subsequently practice producing it. 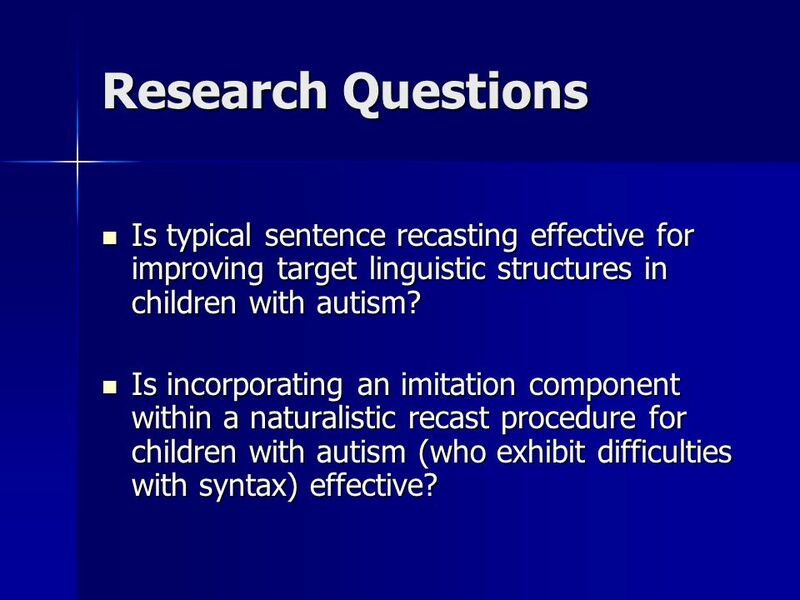 Other researchers, such as Fey and Proctor Williams argue that imitation can complement recasting to maximize effectiveness and efficiency of grammatical interventions. 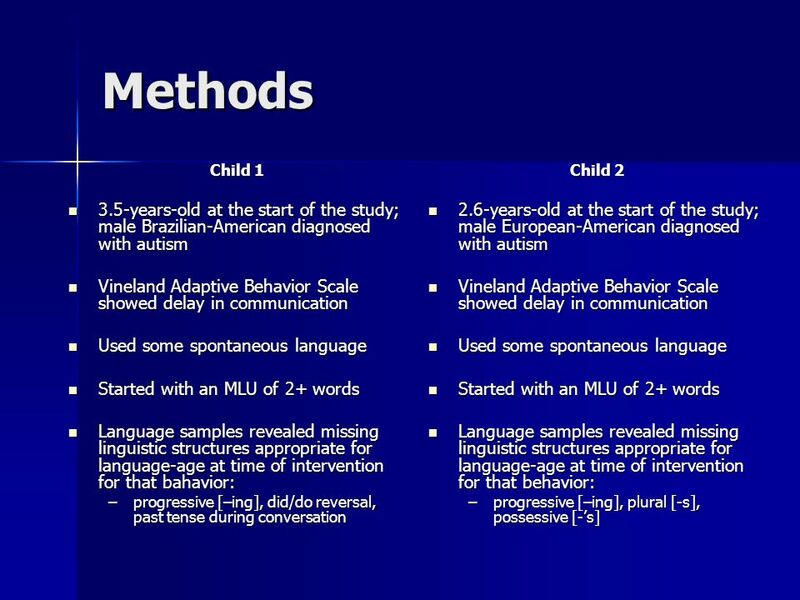 9 Methods Child 1 3.5-years-old at the start of the study; male Brazilian-American diagnosed with autism Vineland Adaptive Behavior Scale showed delay in communication Used some spontaneous language Started with an MLU of 2+ words Language samples revealed missing linguistic structures appropriate for language-age at time of intervention for that bahavior: progressive [–ing], did/do reversal, past tense during conversation Child 2 2.6-years-old at the start of the study; male European-American diagnosed with autism Vineland Adaptive Behavior Scale showed delay in communication Used some spontaneous language Started with an MLU of 2+ words Language samples revealed missing linguistic structures appropriate for language-age at time of intervention for that behavior: progressive [–ing], plural [-s], possessive [-’s] Child 1…and data was collected longitudinally over a period of 2 years; Child 2….and data was collected longitudinally over a period of 1.5 years. 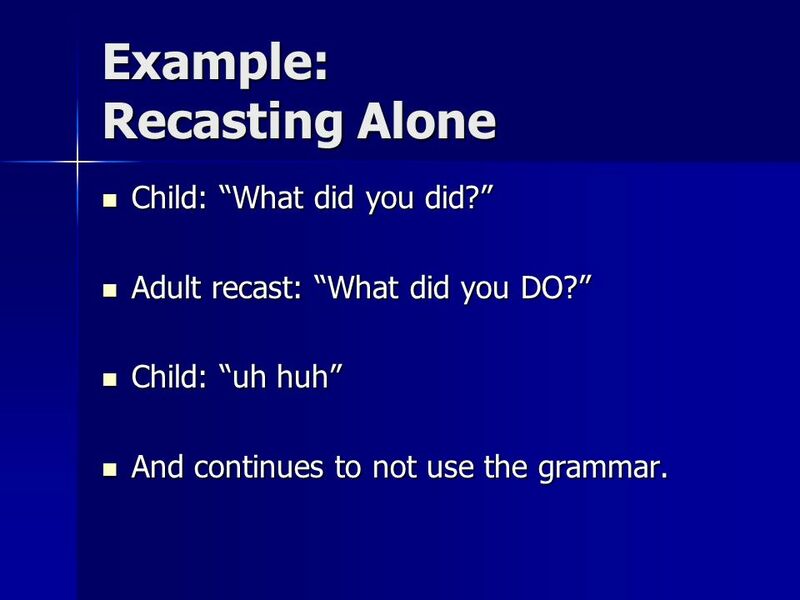 Recast alone – children were NOT prompted to imitate the recasted syntactic structure prior to continuing play/interaction. Example: Child says “Train go”, Adult recasts “Train’s going”, & Child is NOT prompted to imitate recast and can continue playing with trains. 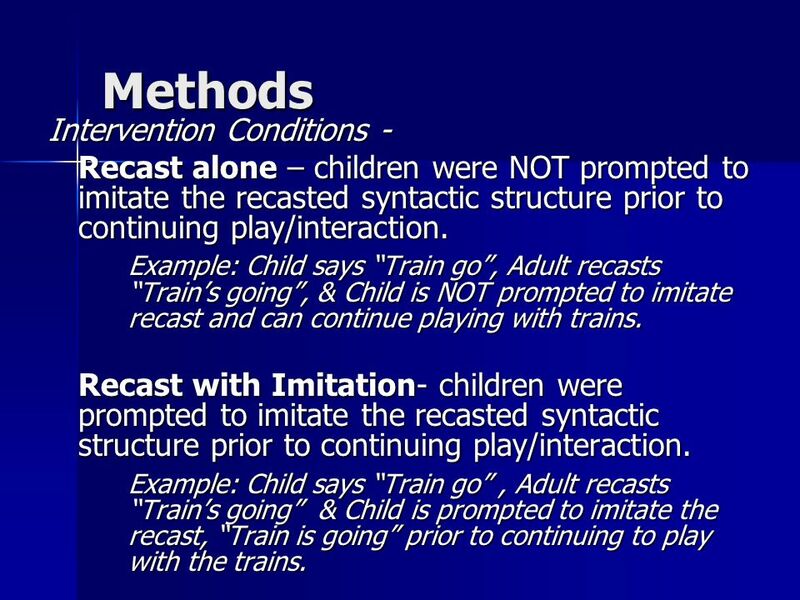 Recast with Imitation- children were prompted to imitate the recasted syntactic structure prior to continuing play/interaction. Example: Child says “Train go” , Adult recasts “Train’s going” & Child is prompted to imitate the recast, “Train is going” prior to continuing to play with the trains. Child: “What did you did?” Adult recast: “What did you DO?” Child: “uh huh” And continues to not use the grammar. Intervention Variable Related Mechanism Related Characteristic of Autism Related Observations Contingent Reinforcement: Child’s access/continuation in play interrupted Motivated the child to initially attend to the recast. Motivation Children typically ignored the recast in the recast alone condition. 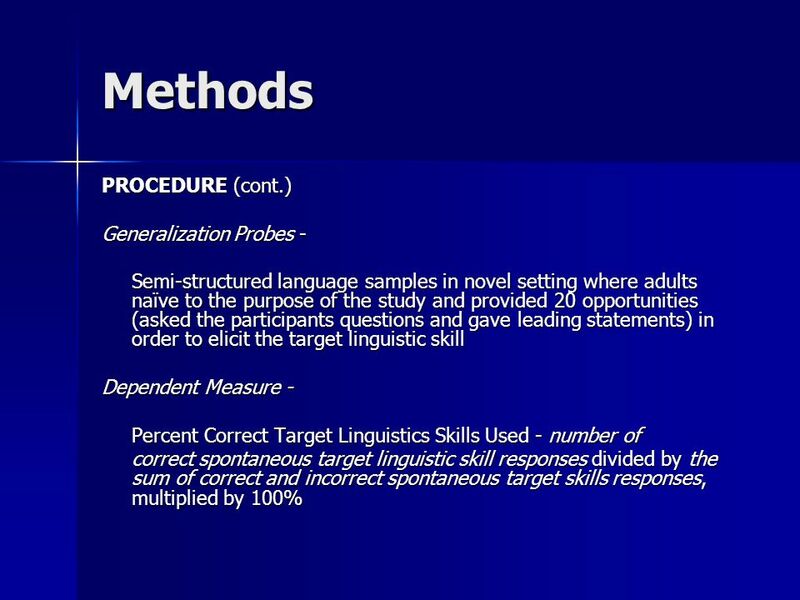 Only an attempt at accurate use led to the natural reinforcer Motivated the child to imitate the recast and use the correct linguistic skill. 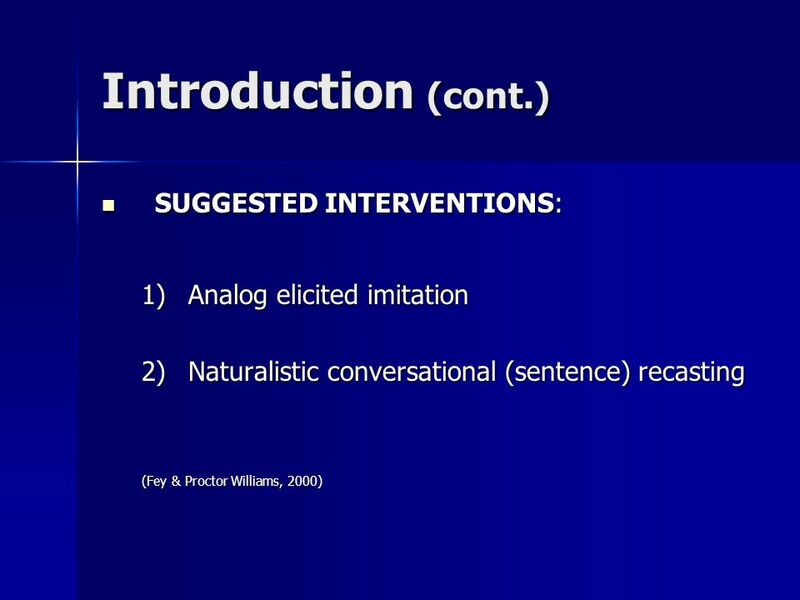 Operant conditioning 1) Rarely imitated during recast alone (ignored or said “uh huh”). 2) Children began imitating and self-correcting. 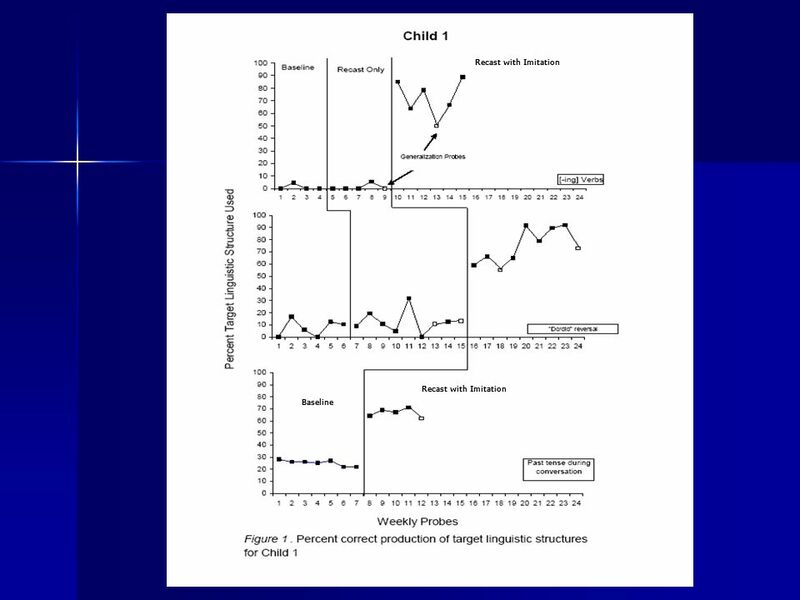 Imitation: Child attempted to imitate the recast with the target linguistic skill Focuses child’s attention onto the relevant cue (i.e., the differing grammar) Selective Attention (i.e., overselectivity; e.g., Koegel, Dunlap, Richman, & Dyer, 1981; Koegel, Shirotova, & Koegel, 2009) 1) If the child repeated their utterance in recast alone, typically omitted the new linguistic skill. 2) When the children first attempted imitating, they again omitted the new grammar. 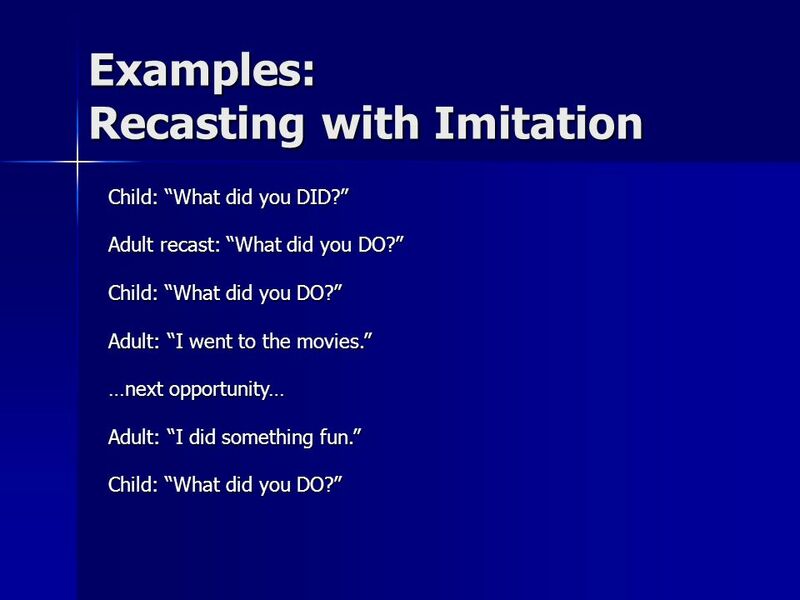 So it turns out, that simply getting the children to imitate the recast, several parameters of the recast alone intervention are altered, and thus may be implicated in the intervention mechanism. The role of contingent reinforcement is necessarily implicated. Related characteristics of autism being operated on is: The most interesting variable to me is the role of imitation and its potential effect on selective attention. 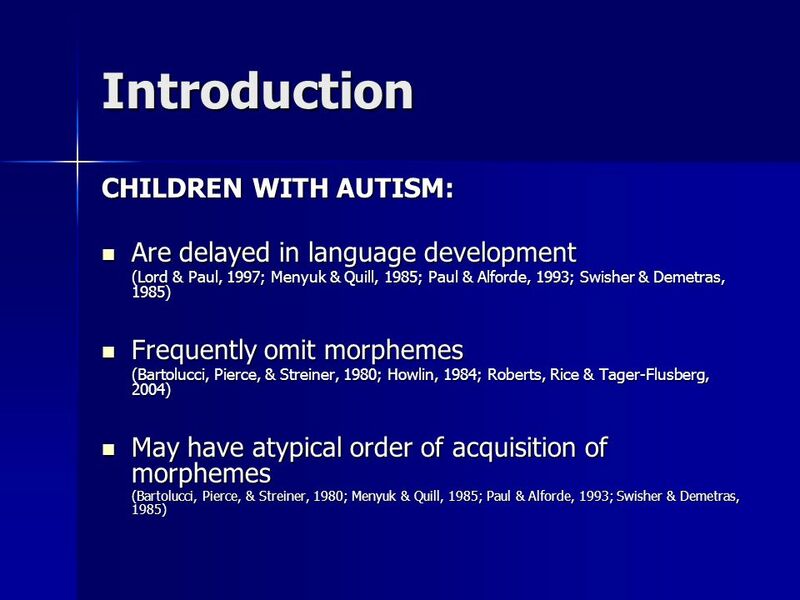 Interestingly, this relates to a study by KOegel, Dunlap, Richman, & Dyer which showed that by getting children with autism to say the specific relevant orienting cue, there was improved performance in discrimination tasks. For example, in a two-step instruction, first touch the dog then touch the bunny, at baseline the non-specific orienting might have been “look at me” instead the specific orienting cue would be to have them say that instruction. Do children start generalizing the grammar rules to novel words/responses? Need to systematically assess Tease out treatment mechanisms Is imitation necessary? 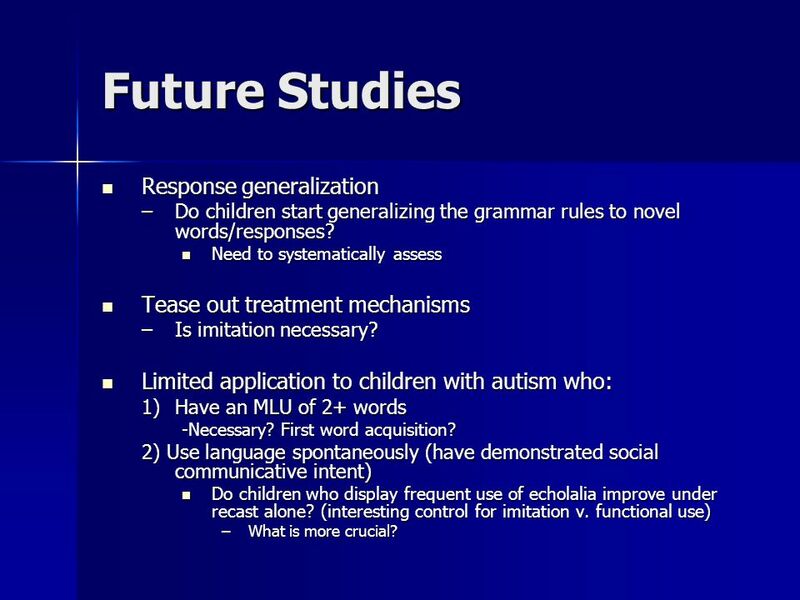 Limited application to children with autism who: Have an MLU of 2+ words -Necessary? First word acquisition? 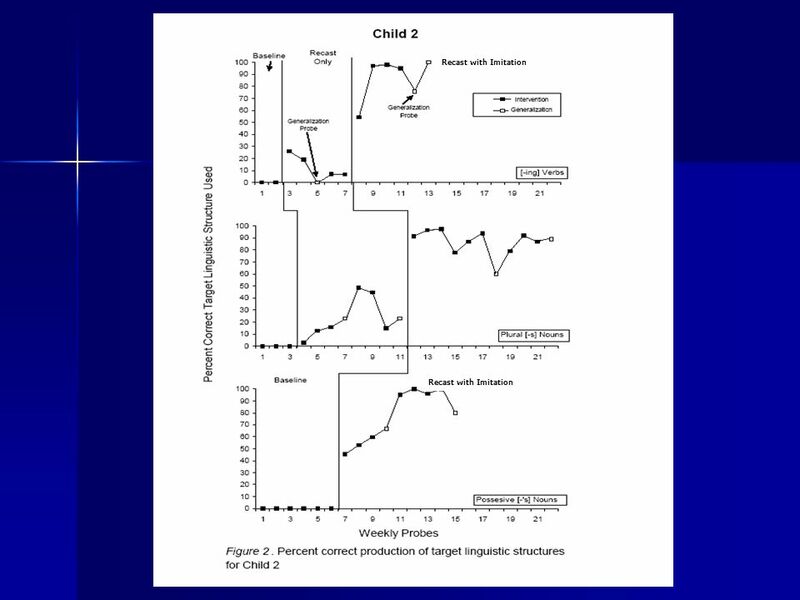 2) Use language spontaneously (have demonstrated social communicative intent) Do children who display frequent use of echolalia improve under recast alone? (interesting control for imitation v. functional use) What is more crucial? 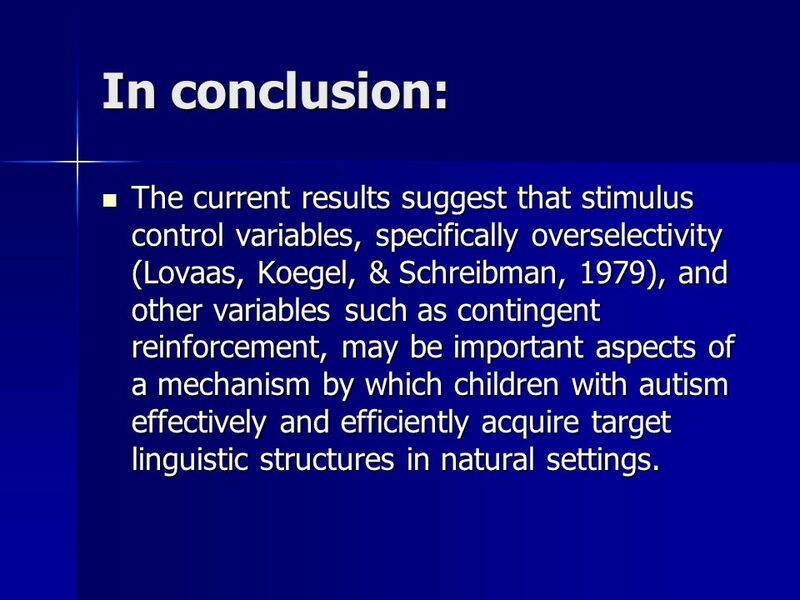 20 In conclusion: The current results suggest that stimulus control variables, specifically overselectivity (Lovaas, Koegel, & Schreibman, 1979), and other variables such as contingent reinforcement, may be important aspects of a mechanism by which children with autism effectively and efficiently acquire target linguistic structures in natural settings. 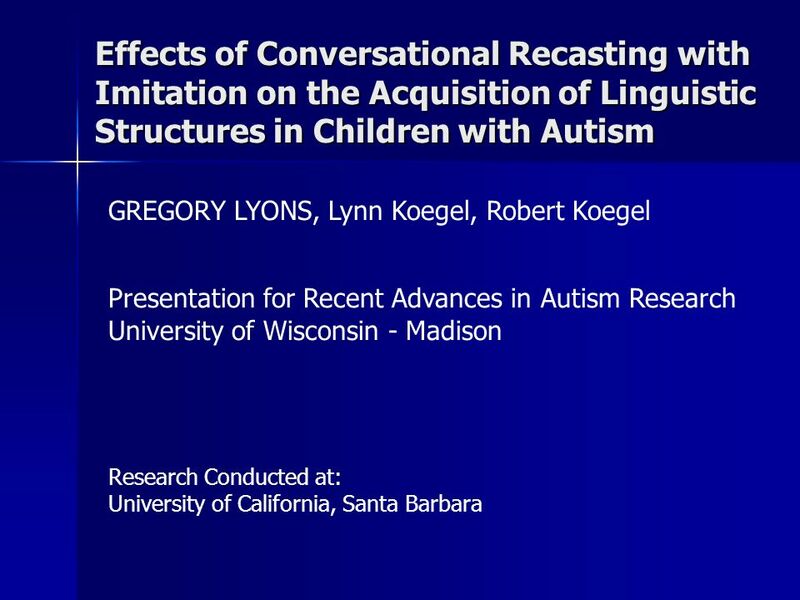 Download ppt "Effects of Conversational Recasting with Imitation on the Acquisition of Linguistic Structures in Children with Autism GREGORY LYONS, Lynn Koegel, Robert." Teaching Persistence in Social Initiations to Children with Autism: A Portable Video Modeling Technology Denise Grosberg Claremont Graduate University. Method Participants 184 five-year-old (M age=5.63, SD=0.22) kindergarten students from 30 classrooms in central Illinois Teacher ratings The second edition. Program Evaluation of Music Therapy: Social Joint Attention Behaviors In Preschool-Aged Children with Autism Spectrum Disorders Karen L. Herzel, Brenda. Formative Assessment & Effective Feedback. Why Formative Assessment? There is a body of firm evidence that formative assessment is an essential component. Discrete -Trial Functional Analysis of Problem Behavior and Functional Communication Training in Three Adults with a Dual Diagnosis of an Intellectual. 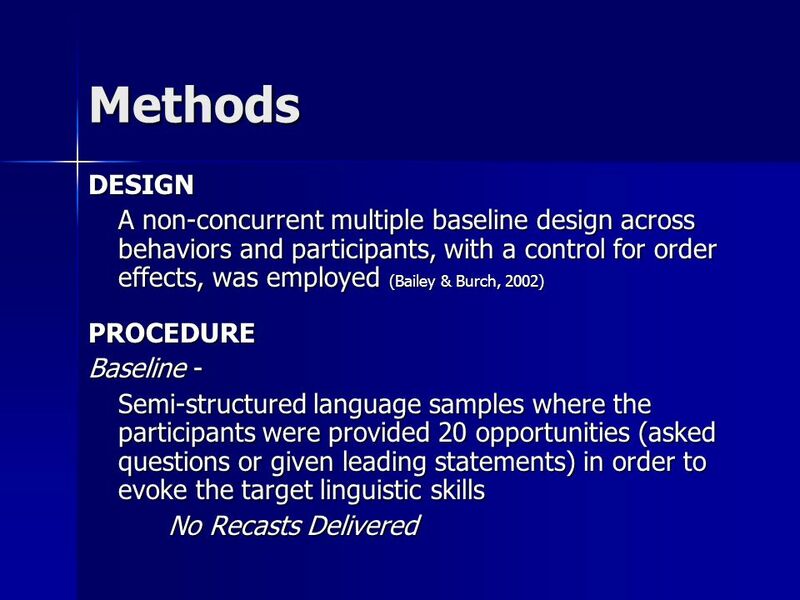 2: FIRST LANGUAGE ACQUSITION The process of how children learn their native language (L1), e.g. The stages: bubbling  words (one word/two words)  complex. The Verbal Behavior Milestones Assessment and Placement Program (The VB-MAPP): Field-Test Data from Typical Children and Children with Autism Chair: Mark. Building Student Independence 1. Staying connected 2. Using Multiple Baseline Designs to Demonstrate the Efficacy of Using Behavior Therapy to Teach Children to Answer Questions Kathryn R. Haugle, Chelsea. Assessment Considerations for Young Children with Cleft Palate Introduction CLEFT LIP AND/OR PALATE Cleft lip and/or palate (CLP) is the fourth most common. Classroom-Based Interventions for Students with Emotional and Behavioral Disorders Joseph Wehby Associate Professor Special Education, Peabody College. Social and Communication Interventions April 10, 2013. Pivotal Response Treament A Brief Overview of an Autism Therapy Approach By-Catherine Livingston and Earlene Darling Brandman University EDUU 676, January.